MAKE YOUR BUSINESS OR EVENT A LANDMARK AND STAND ABOVE ALL OTHERS ! GENERATE MORE ATTENTION, GENERATE MORE EXCITEMENT, GENERATE MORE PROFITS FOR YOUR BUSINESS OR EVENT INSTANTLY ! WITH OUR GIANT INFLATABLES ! OUR GIANT INFLATABLES DRAW PEOPLE IN LIKE A MAGNET ! Everthing You Need Is Included Blower, Straps, Ground Stakes Repair Kit And Complete Instructions. 2 year Warranty On Inflatable And 1 year Warranty On Blower. 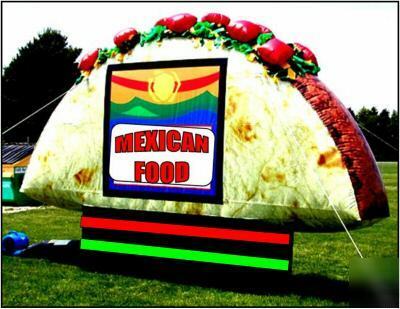 Giant Advertising Inflatables Are The Fastest Growing New Way To Advertise!